Produces a surface that is chemically resistant and wear resistant for many industrial, commercial and residential needs. Available in wide range of colors and in either smooth, semi-gloss, or textured, traction-enhancing finishes. 24 Standard Colors. Custom Colors are available. POLAFLOOR COLORCOAT is a superior quality, single component, acrylic based color coating and protective wear surface. It produces a surface that is chemically resistant and wear resistant for many industrial, commercial and residential needs. POLAFLOOR COLORCOAT is an aqueous based product that has low odor and is fast drying to reduce downtime. It is available in wide range of colors and in either smooth, semi-gloss, or textured, traction-enhancing finishes. Produces a tough waterproof coating to restore and protect wood decks and bridges. Protects and seals concrete floors in basements, equipment rooms and access tunnels. Coats and waterproofs stucco and exterior plaster finishes on balustrades and porticos. Can be used over concrete, insulation, mineral composites, wood, wood composites and other surfaces. Surface must be firm, dry and free of loose debris, dirt, grease, oil, mildew, or any substance that may interfere with bond. All cracks and spalled or damaged surfaces must be repaired prior to coating. It is advisable to test previously coated or treated surfaces by applying POLAFLOOR COLORCOAT (and primer if recommended) to a 4’ x 4’ area. After the area has cured, inspect the coating for adhesion, blisters, pinholes, or other signs of incompatibility. It may be necessary to sand or rough some surfaces to improve adhesion. POLAFLOOR COLORCOAT is applied straight out of the container after 2 minutes of low speed power stirring. POLAFLOOR COLORCOAT is usually applied using a soft brush or roller; however, airless spray may also be used. Two coats are applied at 200-240 square feet per gallon each. 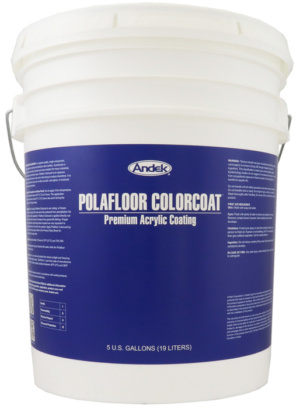 For a traction-enhanced surface, add 2-4 pounds of dry broadcast medium aggregate per gallon of POLAFLOOR COLORCOAT. Blend in the aggregate using low speed mixing and roller apply as the second coat. For more texture, increase the quantity of aggregate. Andek can supply the aggregate if needed. For added wear resistance or resistance to ponded conditions, topcoat with CLEARCOAT 44 at 250-300 square feet per gallon. Equipment may be cleaned with water while the POLAFLOOR COLORCOAT is still wet. Do not apply to frozen or saturated surfaces. Do not apply if the temperature cannot be maintained above 45°F for 6 hours. This product is not intended for use where standing water exists unless it is topcoated with CLEARCOAT 44. It is advisable to test previously sealed, treated or painted surfaces.